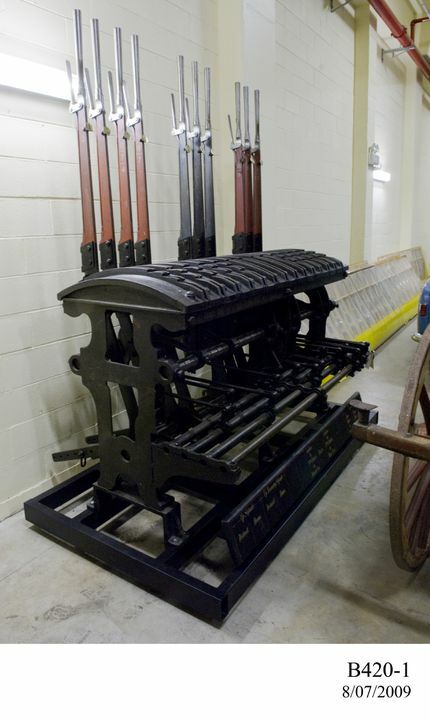 This is a mechanical interlocking machine fitted with ten levers in a metal frame. An interlocking machine is a frame comprising a row of hand-operated levers for changing railway points and signals. The machine interlocks the point and signal levers so that they must work in harmony. The levers are at the signalman's shoulder height to give a mechanical advantage, while the locking components were set up in a signal box or station below floor level. The locking mechanism was attached to wires and metal bars which extended outside to operate the signals and points. The machine "locked" automatically so that conflicting train routes and movements could not be set inadvertently by the signalman. This frame was constructed for 14 levers but numbers 5, 6, 10, and 11 are not fitted. A rectangular wooden sign indicates which lever controls which signals and points. This interlocking machine was manufactured in about 1879 by McKenzie & Holland of Worcester, England, and was known as a No. 5 pattern. McKenzie & Holland were railway engineers and manufacturers of signals and interlocking machines. They were established in 1861 as Mackenzie, Clunes, & Holland, and took over the old Vulcan Iron Works, at Shrub Hill. The design for this machine was patented (No. 1963) in 1866 by J. McKenzie, T. Clunes and W. Holland. The patent documents described the locking mechanism as being of the cam and soldier type, however in Australia it was normally referred to as the rocker shaft type. McKenzie & Holland interlocking machines are said to have revolutionised the world's railways by allowing for safer rail travel. They were used in Britain, Australia, New Zealand, India and the United States and a factory was established in Melbourne in 1880 for their manufacture. McKenzie & Holland continued to supply NSW with mechanical interlocking machines until about 1907 after which time they were made locally by the NSW Government Railways' Signal Engineers Branch. In 1905 McKenzie & Holland were acquired by the Consolidated Signal Co., and in 1920 became part of Westinghouse. The Worcester works closed in 1921. Information provided by Bob Taaffe, 1988. The first proposal to introduce interlocking machines and other signalling appliances to improve safety on NSW railways was suggested in 1873 by Donald Vernon. Nothing was done in NSW but Victoria commissioned their first one that year. New South Wales remained resistant until three deaths in a train collision at Emu Plains in 1878 and the display of both McKenzie & Holland and Saxby & Farmer interlocking machines at the Sydney International Exhibition in 1879. This interlocking machine, made by McKenzie & Holland, is one of those displayed at the Sydney Exhibition held in the Garden Palace erected in the Botanic Gardens. It is thought that the machine was set up locked for a double track main line with a branch line junction and level crossing gates. McKenzie and Holland's representative in Australia was William Griffiths, C.E., while John Parry also travelled out from the firm and was in charge of the Exhibition display which included working models of a railway station and junction, illustrating the interlocking and working of points, signals and level crossing gates. The apparatus won a First Degree of Merit and the judges' report said that "this arrangement of interlocking ? has great efficiency, combined with moderate cost". The NSW Government decided to adopt the system and Parry was appointed to supervise its installation. By 1889 he was the Railways' Interlocking Engineer and was employed here for almost 35 years. After its display at the Exhibition this interlocking machine was remodelled and commissioned on 7 March 1883 for operation at Campbelltown Junction, where the Camden Tramway met the main Albury to Sydney line. It was removed on 5 January 1891, remodelled, and installed at Macdonaldtown railway station on 23 November 1891 for the quadruplication of the line. Although an early application, this machine was not the first to be used in NSW. This occurred at Burwood station in 1881 where an interlocking machine controlled the level crossing gates at Burwood Road but it was removed in 1892. Two other early machines were used in Sydney Yard. In 1913 this McKenzie & Holland interlocking machine was removed from Macdonaldtown, replaced by an automatic apparatus, and donated to the Museum in 1914. Co-incidentally, Parry retired from the Railways in 1914 and may have been involved in the decision to preserve the interlocking machine he had brought out from England. As well as being displayed over the years in the Museum, the machine was exhibited in 1917 with the Museum's Locomotive No. 1 at the Industrial and Models Exhibition at the Railway Institute near Sydney Terminal Station (Central) and again in 2005 at Central Station to celebrate the 150th anniversary of the NSW Railways. "Retirement of Mr John Parry, Comptroller of Stores" in "N.S.W. Railway and Tramway Budget", 2 February 1914, p.191. This object was displayed in an exhibition at Central railway station on 24 September 2005 entitled 'NSW Railways ? the first 50 years' held to celebrate the 150th anniversary of the opening of railways in NSW.